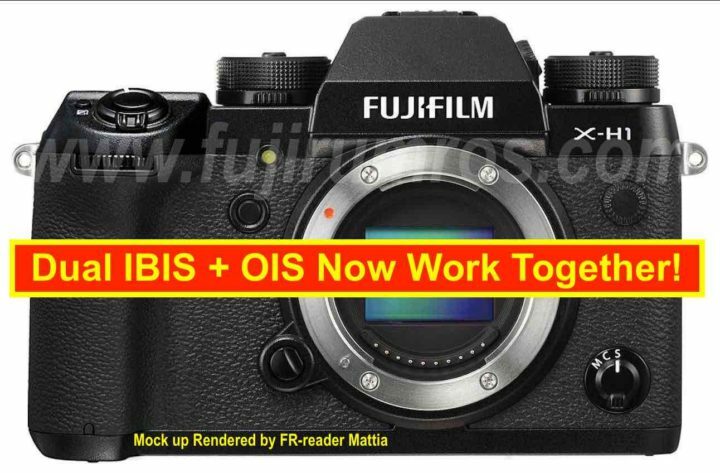 Fujifilm X-H1: Dual IBIS + OIS Combo Now Working Together! Back in October, I told you that “currently” the OIS and IBIS on the Fujifilm X-H1 do not work together. However, I also told you that this could be related only to the current firmware and that maybe Fujifilm might be able to implement this feature in future. I hear that Fujifilm worked on it and that OIS and IBIS now work together. Just in time for the official Fujifilm X-H1 announcement on February 15. Now, I have no idea about the detailed way it works and if there are still some limitations of some kind. For this, we will have to wait February 15, when the Fujifilm X-H1 will be announced and we will know everything in detail. But it’s good to know that you will be able to use both, OIS and IBIS, together. I have my live blogging kit ready… make sure to join us on FujiRumors for the big live blogging on February 15. What About Sensor Shift Multishot? Back in September, I told you that the Fujifilm X-H1 will not have the sensor shift multishot feature. On this front I have not heard anything new, so I guess that at launch it won’t have this feature. But also in this case, maybe Fujifilm will figure it out right in time. previous post: Fujifilm Sponsored TCSTV Movie Shot with “Unreleased Gear” Screening at Movie Theater on February 16. Fujifilm X-H1 Film?